Hi all, finally found a page where people could help me, here is the issue. Had the idea to build a damin the creek beside the house 1 month ago, the objective is to build hydropower setting for lighting the backyard with leds bulbs at night.. So i jumped into that DIY pelton wheel/ 3 phases axial fluxdynamo project. The dam and artificial stream are done. The pelton wheel and the dynamo casing are done. The dynamo still won't produce volts and amps enough for charging a battery bank. All i found in my area is 19 gauge wire and 3/4 x 1/8 neomagnets. Started with big 150 feet coils (? Turns) and big ceramic magnets and tryed many differents settings whit no succes. Thought my last setting with a 6 coils (120 turns, approx 2 inch large) stator between two 8 neomagnets rotors would finally produce some juice. It dont. The rotors are close enough so the fixed back rotor gets the front loose rotor turning with him. All the 3 phases connection are OK. Waiting to get a amp "clue" before buying the rectifier and other electronic parts. 8 inch diameter stator with six 19 ga coils with a 3/4 center hole wired in a 3 phases star. 16 3/4 large and 1/8 thick neo magnets setted on two rotors turning as closr as possible each side of the stator. No succes, should i go with a thinner gauge or bigger magnets? Been working on this project for a while now, and i'm absolutely not a tech. Ima carpenter loving DIY projects. I read a lot about dynamos but cant find why it doesnt get ant sign of life on the multimeter. Or maybe it's normal to get no readings on the analog multimeter checking only one of the 3 -2coils phases? Would have to wire the next components to get a correct reading? How is each magnet polarised, i.e. where are the N and S poles? Which measurement range of the meter did you use? Are the two coils of a pair correctly phased, i.e series-aiding? I do think The coils are corectly phased. On the right side i start the blue red and yellow phases separatly and the phases come back on the left poles separatly, the the 3 starting poles will go to the rectifier and the ending poles goes to the black pole together . The magnets are cotrectly setted in N-s-n-s series so the rotors on each side of the stator attract each other, the the back rotor.is loose, turning with the front one because of the MF. I use the GB analog meter model GMT 312. I get a Ohms reading. Waiting for the needle to move in ACV and DCMa lowest settings. DCmA won't give a meaningful reading when the generator is producing AC. Took the unknown component on a jacuzzi 3phrases 10 amp110 volt motor, thought it was a rectifier, but what is it? Would i need to install the rectifier before i do real meter readings? A three phase motor would not have a rectifier and 110 VAC would not be a common three phase motor voltage either. My guess is you pulled a thermal protection device out or a starter relay, which is not a rectifier but temperature controlled switch ora current/voltage controlled switch. Without far more information on the actual devices and components used we won't be able to help you much there. The next issue is the speed at which the rotor turns. The faster it goes the more voltage it makes. Beyond that having an apparent 8 pole rotor and a 6 pole stator probably doesn't help either since no two stator pole are in proper alignment with any magnets nor are they in any proper phase angel separation match as well. If it was me I would have set it up as a single phase system with all 6 stator coils in series and in the same phase polarity and used a 12 pole rotor given the wide spacing of everything. 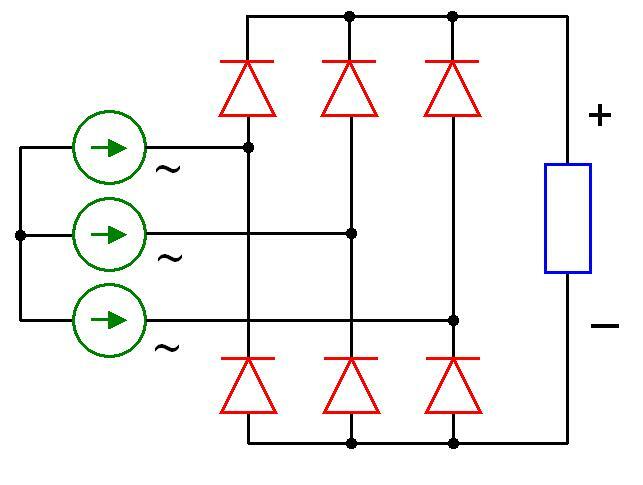 From there if you managed to get too much voltage and not enough current it could be reconfigured to a 2 x 3 series parallel or a 3 x 2 series parallel setup. With that all you would need is a bridge rectifier and a properly sized capacitor to get your DC power from it. The coils should be as far from the axle as possible. However the first thing you do is put 4 diodes on the leads of one coil and then a 100u electrolytic and then a torch globe. Spin the impeller with your fingers and watch the globe glow. How bright? As far from the axel, you means as far from the rotors as possible, but still inside the emp? I have been teaching Physics all my life and the schools only give the smartest classes. You wonder why. The students follow my strict instructions. That's what makes them clever. The coils have to be as far from the centre of rotation as possible. This causes the magnet to pass the coil as fast as possible. When the magnet passes as fast as possible, the maximum voltage is generated. (Call the peak voltage). The current is another matter. The current that is generated depends on the strength of the magnet. These are two somewhat separate values, however the greatest output (called wattage) is achieved when all these criteria are a maximum. What if i mount all the 16 magnets on a single rotor setting? What if i use different size of magnets on each rotors, like mounting 12 x 3/8 large neo magnets on the back rotor, very well centered on 12 x 3/4 neo magnets on the front rotor? Is it a good idea to set an iron plate sticked behind the rotors? Am i supposed to get signifiant readings, plugged straight to the +/- after the 3 phases diode bridge? As I said before. You have to try one coil and a globe to see what you get. It is absolutely pointless doing anything else until you know what you are going to get out of one unit. Then i'm on it, i'll come back with the readings! I would recomend doing some in depth study on how three/multi phase alternators and generators work before going too far with anything. If you don't know how alternating current motors and generators work there is no point or gainful purpose in just throwing things together at random and hoping they somehow will work properly or efficiently in the end. Any good PDF on this?